How has research and development shaped the Dutch economy over the last few decades? How can innovation in sanitation help rural Indian communities to overcome disease? And how long can the EU survive without reform? These are just a few of the questions tackled by our researchers in May 2017 — in one book and four working papers, among many others. Click here for the full list of our most recent publications. ‘A Second Chance for Europe – Economic, Political and Legal Perspectives of the European Union’ calls upon us to rethink and reboot the European Union. The book dissects the EU’s many vulnerabilities: how some Member States are backsliding on the rule of law, freedom of the press, and control of corruption – and how globalisation’s ‘discontents’ are threatening the liberal international order. It examines the need for a common immigration policy; the need to rethink the unsustainable debt overhang of some Eurozone countries; and the need to use education to foster a European identity. Given the sum total of these vulnerabilities, the book argues, the EU may not survive beyond 2025 in its present form – that is, unless decisive action is taken. In turn, the book puts forward a number of workable solutions: a European economic model to secure full employment; a stronger European Court of Human Rights to counter systemic violations; a points-based immigration policy; clear exit options for the Eurozone; and an Open Education Area with a common second language. These solutions may reduce the number of EU countries, but would increase cohesion and overall survivability. By Prof. Jo Ritzen. ‘The productivity effect of public R&D in the Netherlands’ finds that extra investment in public R&D in the country, for the period 1968‐2014, had a clear positive effect on total factor productivity growth. Taking into account the costs of these extra investments, the paper finds that the rate of return to such a policy is positive and generally high, and that including private R&D in the policy from the beginning is better than increasing public R&D alone. By Profs. Luc Soete and Bart Verspagen and Dr. Thomas Ziesemer. ‘The role of migration-specific and migration-relevant policies in migrant decision-making in transit’ takes the situation of migrants in Greece and Turkey as its case studies. The paper finds that, in transit countries, the policies that most strongly influence migrants’ decision-making are adverse migration-specific and migration-relevant policies. By contrast, in destination countries, favourable migration-specific policies appear to be more important than migration-relevant policies there in determining the choice of destination. By Dr. Katherine Kuschminder and Prof. Khalid Koser. ‘Role of WASH and Agency in Health: A study of isolated rural communities in Nilgiris and Jalpaiguri’ presents the results of a study of 20 villages located in two districts, Nilgiris and Jalpaiguri, in two distinct Indian states – Tamil Nadu and West Bengal respectively. 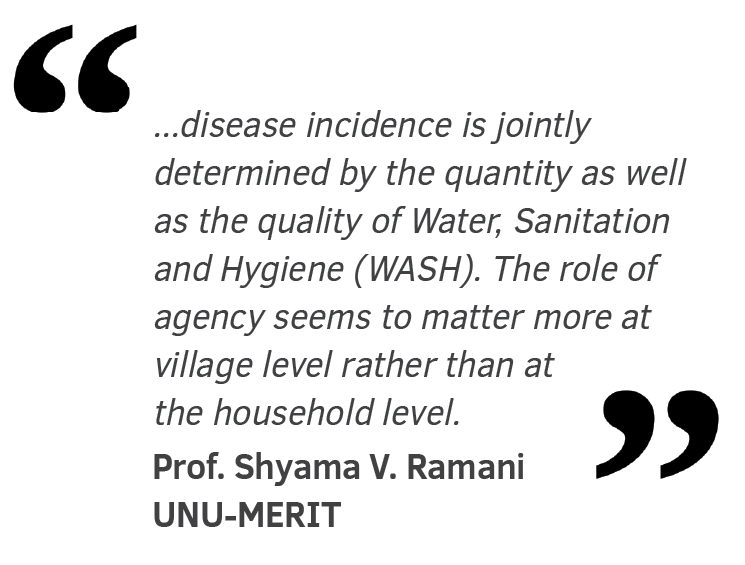 The central research question is: What is the role of WASH infrastructure and capabilities and local agencies in containing the incidence of excreta-related diseases in isolated rural Indian communities? A novel multi-level model is developed and estimated and further validated through focus research groups. It confirms that disease incidence is jointly determined by the quantity as well as the quality of WASH. The role of agency seems to matter more at village level rather than at the household level. By Prof. Shyama V. Ramani. ‘Regional analysis of sanitation performance in India’ examines the existing anomaly between meagre sanitation productivity and enhanced resource allocation in rural sanitation in India. The study attempts to develop an instrument to monitor the differential regional performances across India. The efficiency analysis reveals huge potential of India to attain a far higher sanitation access and usage with the given flow of social spending. This index is expected to serve as a useful tool for policy watch as it clearly identifies the best and the worst performers by allowing fair comparison among them. By Debasree Bose and Dr. Arijita Dutta.